Your Power-Sports trail will conquer even more trails and terrain with their own Polaris Sportsman 850. This Special High-Performance ATV delivers tons of fun for any 5-10 year old and theres even a flip-up backrest for a passenger. This 24-Volt rechargeable battery powered ATV. Outdoor oriented kids will really enjoy the 850s rugged, shock-absorbing suspension and knobby traction wheels as they cruise at 3 1/2 to 7 mph on grass, dirt or hard terrain. Theres also a front and rear luggage rack. 24-volt rechargeable High Output battery and charger included. Made in USA in Peg Perego`s Fort Wayne Indiana facory unsing domestic and global components. This high-performance ATV delivers tons of fun for any 5 to 10 year old, and theres even a flip-up backrest for a passenger. 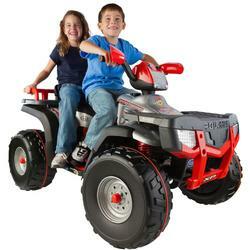 This 24-volt rechargeable battery-powered ATV increased riding time and maximum control. Outdoor-oriented kids will really enjoy the 850s rugged, shock-absorbing suspension and knobby traction wheels as they cruise at 3.5 to 7 mph on grass, dirt, or hard terrain. Theres also a front and rear luggage rack. A 24-volt rechargeable high-output battery and charger is included. Your childs Peg Pérego riding toy will never run out of juice when you have this 24 volt rechargeable spare battery on hand. Swap it in when the riding toy runs down for non-stop fun. For use with Peg Perego High-Performance 242 Volt Childs Vehicles. For use with Peg Pérego High-Performance 24 Volt Childs Vehicles. This Peg Perego 24 volt charger charges the battery used in all Peg Perego 24 volt vehicles. The most common of these vehicles are the Gaucho Super Power, Polaris Ranger RZR, and Polaris Sportsman 800 Twin.